Our last couple of posts showed a little of the village of Scarborough. This post shows a little of why Scarborough is so special to its inhabitants. 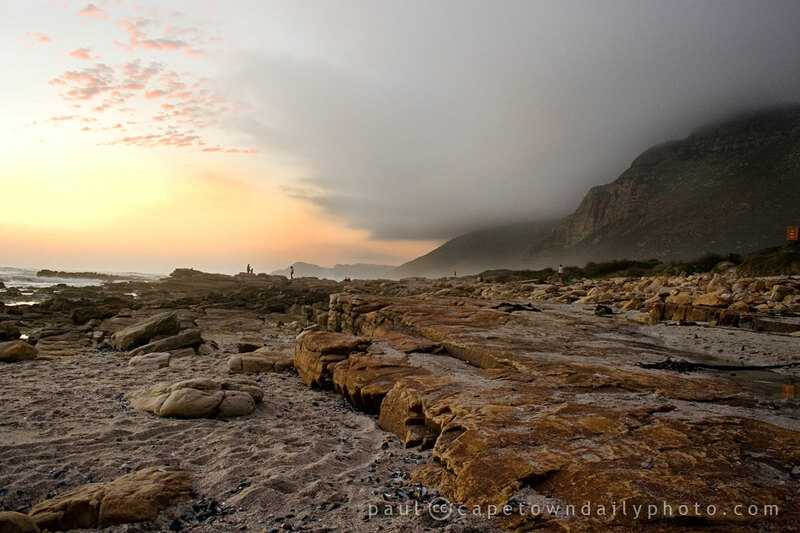 The beaches are wide, open, almost untouched and the sunsets in this area are reportedly some of the best in Cape Town. Even though this side of the beach looks fairly rocky, behind me there's a long sandy beach - with an ocean that is (based on the sign in the last post) safely swimmable. The Scarborough Conservation Group was established in 1992 with the goal of changing Scarborough into a Conservation Village and ensuring that the natural environment is properly taken care of. They're been involved in beach clean-ups as well as the replanting of indigenous vegetation in the area. You can read more about their goals and activities here. Posted in Landscape and tagged beach, sunset on Wednesday, 2 September, 2009 by Paul. This is an absolutely awesome picture. I love the composition of this photo Paul – nice one! This is a great shot, Paul. Lovely angle! Thanks guys. When I look at the photo it feels like I’m looking through a window. I just love it also.